In the early years of my more than three-decade career here at the Catholic Standard, I covered events with Mrs. Bush on several occasions. She always seemed poised and calm and more than willing to suffer the press and cameramen dogging her every footstep. What I learned is that her many years as the wife of a politico certainly taught her tact and diplomacy. I remember early in her husband’s presidency I was covering Mrs. Bush’s visit to a Catholic school in Washington where she brought a bundle of books to donate to the school library. During the visit, she read to the children and then invited their questions. Mrs. Bush handled quite deftly the typical queries from the children — What’s it like to live in the White House? Why didn’t she bring her dog with her? etc. Then came a question from out of left field. A student stood up and wanted to know if the first lady could intervene in a standoff between the student and her older sister because the older sister would not allow the younger girl to play with her Barbie dolls. The young girl seemed to appreciate the answer because she rewarded Mrs. Bush with a hug. The first lady not only charmed her questioner, but the other students and the adults who witnessed the interaction. But, my brush with Mrs. Bush dates back even further than that. When George H.W. Bush first sought the Republican nomination for president in 1980, Mrs. Bush visited Rider College in New Jersey where I was a journalism student. We wannabe journalists got to stumble and fumble along as we covered the visit for our campus newspaper. She was patient and tolerant of us as we learned our profession. Over the years, I have learned that her kindness was genuine and not just something hustled out to craft a public image. A buddy of mine — a railroad worker who sometimes served on trains carrying dignitaries — told me that when Mrs. Bush, a frequent passenger, was on board she made sure the train employees took time for lunch. On many occasions the first lady actually brought brown bag lunches for the men who worked the train but could not leave their posts. Sometimes, my buddy told me, the first lady would sit and chat with them. Much has been written and commented upon about her devotion to promoting literacy and reading. But, Mrs. Bush was equally committed to other causes as well. She was a staunch advocate for civil rights. One biographer noted that back before her husband entered politics, when the Bushes traveled to their summer property in Kennebunkport, Maine, Mrs. Bush would not stay in hotels where blacks would not be accommodated. Later, when she became first lady, Mrs. Bush hired Anna Perez to be her press secretary, the first African- American to hold that post. Mrs. Bush also not only championed those who contracted AIDS-related illnesses, but fought to overcome the stigma and the prejudices associated with the disease. When she was first lady from January 1989 to January 1993, erroneous assumptions were made on how AIDS could be contracted. She visited hospices where children and adults with AIDS were being treated and she was frequently photographed hugging and interacting with the patients. She was doing this at a time when many thought the illness could be caught through casual contact. 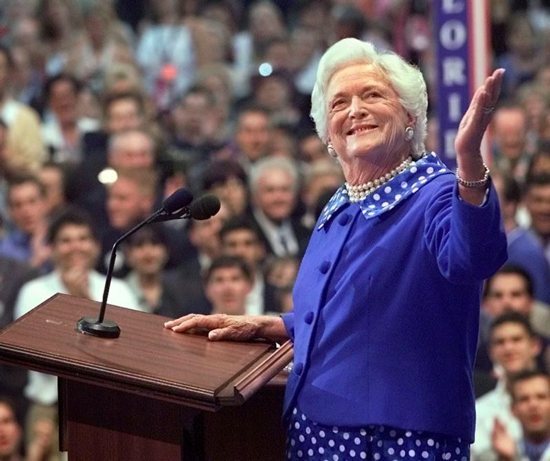 I have always been fascinated by the fact that she was the wife of our 41st president — George H.W. Bush — and the mother of our 43rd president — George W. Bush. Only one other woman in American history holds that distinction of being wife and mother to a president. Abigail Adams was the wife of our second president, John Adams, and mother of our sixth president, John Quincy Adams. Mrs. Bush also was a distant relative of Franklin Pierce, our 14th president. You would think with that pedigree, she would be a stuffy, stiff and formal person. From what I understand that is far from true. She is said to have had a wonderful sense of humor. When she and President Bush visited England, then-Prime Minister Margaret Thatcher’s husband, Dennis, greeted her with a kiss on the back of the hand. When photographers who missed the encounter asked for it to be repeated, Mrs. Bush took Thatcher’s hand and kissed it. In addition to her husband and five children and 17 grandchildren and seven great-grandchildren, Mrs. Bush is survived by many like me who had brief interactions with her, and came away convinced they encountered a great lady. She will be sorely missed. Commentary originally appeared online in the Catholic Standard, newspaper of the Archdiocese of Washington.